Archives for June 2010 | Erin Vang | So you think…? A few years ago, after seeing a character in Six Feet Under use a neti pot, I mumbled something to my wife about having always been curious to try a neti pot. A few days later, she brought one home from the store for me, and I’ve been a neti pot fanatic ever since. I’ve spent my entire life dealing with various hay fever-like symptoms, just like my mom, brother, grandfather, and numerous other relatives. Since it was normal in my family, I thought my way of life was universal, but it turns out that normal people do not, in fact, always have at least one Kleenex in their pockets at all times. I was in college before I realized that some families don’t even buy Kleenexes unless someone has a cold. Everyone in my family keeps a box of Kleenex in nearly every room of the house! Apparently it’s also not normal to wake up in the morning so congested that you can’t wait to take a shower, because that’s where you keep your neti pot, and after using your neti pot in the shower, your nose is cleared out enough that you can breathe through it again. I’ve never been sure why I’m so full of snot, exactly. I was treated for allergies during my teen years by several allergists whose methods are scoffed at now, and allergists I’ve seen since then have all told me I have no allergies. The last one I saw told me I have “non-allergic” or “mechanical rhinitis,” which basically means that my body reacts to just about any foreign body as if allergic to it, indiscriminately. So, I’m not actually allergic to dust, molds, mites, tobacco, smoke, smog, pollen, dander, or any of the other hundred typical allergens that they tested me for, but my system freaks out and puts on an allergy party for all of them anyway. The basic hay-fever symptom is for your immune system to detect an allergen, trap it with mucus, and evacuate it. My system does that, and how exactly this is different from actually having allergies to all those things is beyond me. One difference seems to be that if these were actual allergies, then somebody would have a clue how to help me. It wouldn’t be that big a deal if my system would evacuate mucus efficiently, like it’s supposed to, but it doesn’t. Apparently there are several reasons for this. One, rhinitis patients’ snot is thicker than normal, so it gets stuck. Two, there’s more of it, so the body gets behind in clearing. Three, until last week I had a deviated septum. The septum is the thin bone that divides right nostril from left. It’s a tongue-and-groove kind of thing, and mine had gotten derailed from its groove so that the front tip was off the rails toward the left, and the back end was off the rails toward the right. It was basically diagonal, which is why my nose has always looked a little curved if you looked closely. My ENT knocked it back into the groove and then shaved it down on one side until it was even. This is bones we’re talking about, people. Mine were seriously out of whack. They’ve been that way since 1994—therein lies a story. I was walking from the Dempster train station to my apartment by the lake in Evanston, IL. I was coming from a gig downtown and had my (heavy) horn backpack on, and I was hurrying home to eat and change for a gig I had to drive to, so I was pitched forward and walking fast. As I walked past a coffee shop (Café Express, which most of us nicknamed “Café Repressed”), I kept walking fast but turned to look in the window to see if anyone I knew was there. Another pedestrian, also moving fast but toward me, was doing the same thing. We slammed into each other, the right side of my nose striking her left cheekbone. We hit so hard we both fell backwards. We helped each other up, made sure we were both okay, exchanged apologies, felt stupid, and continued on our ways. My nose hurt like hell and soon I had a pounding headache. While eating my hurried dinner, I tried to remember what the checklist for concussion was and concluded that if I was coherent enough to be working on that problem, I was probably okay, although my head pounded, my vision was blurry for a while, and my cognitive functioning was off kilter. I drove to the gig, navigating Chicago and operating my vehicle successfully but was completely unable to comprehend “All Things Considered” no matter how hard I tried to focus on it. I got through the gig somehow, and by the time I drove home, I was better able to understand the radio. Remembering (I thought) something about not taking pain meds or sleeping when you have a concussion, I held off as long as I could on both but finally gave up and did both. I spent most of the weekend with a headache, and my nose was sore and creaky, but I seemed to be okay, so I made a non-urgent appointment to see my regular doctor that Thursday. By the time I got to my doctor on Thursday, something else had come up that took over the visit (boring story) and it was literally as an afterthought that I said, “Oh! The reason I came here in the first place was…” and then I told the tale of my nose injury. She checked it out, confirmed that my nose was creaky (gosh, thanks! ), and said she just saw a little swelling but that it was nothing to worry about. Four, until last week, I had oversized turbinates. Turbinates are bones on either side of the nose covered with fleshy material, and they function as humidifiers. Mine were too big, which meant they were narrowing the passages that are supposed to handle drainage. In March my ENT had done a less invasive procedure (zapping them with a small RF probe) to reduce them, which had helped but not enough. This time he used sharp tools to cut them down to size, and on the right side he actually had to shave down the bone, which apparently was way too large–just bad genetics there. Once I’ve finished recovering from all that, my nose should work much better. I’m looking forward to it! I procrastinated figuring out how to use it for several weeks. Like most people, I was afraid. I’ve had those awful swimming pool experiences that make you dread getting water up your nose. Then one morning, I heard a story on Morning Edition about neti pots and decided to get over my bad self. I googled up some video demonstrations like this one and then got to work. Five minutes later I was triumphant but unimpressed. It wasn’t that bad, and I did get some crud out of my system, but it didn’t feel revelatory. About an hour later, though, I could feel things unplugging, and gradually everything opened up like never before. My voice even sounded different. It was great. A few days later, I left on a business trip to Tokyo, and to save luggage space, I decided not to bring my new neti pot along. What a mistake! I’d forgotten that the Great Dust Cloud of China hasn’t been very good about staying inside China’s borders. I spent the entire week in Japan looking for neti pots or anything else that could possibly work as a temporary neti pot. Toward the end of our visit, my colleagues and friends Trish and Katja and I visited Kappabashi Market, a neighborhood famous for its restaurant supply stores. All three of us dropped far too many yen at a particularly nice ceramics store, and my browsing was considerably slowed down by my quest to find a small teapot or soy sauce pot or some other kind of pot whose spout would have the right fit for my nostrils—without actually testing the spouts on my nostrils, of course. I did not succeed. I also was unable to find a bottle of water with a sport top, something I’d seen pressed into emergency neti pot stand-in duty on somebody’s blog. Nor did I successfully purchase plain old salt, mistakenly thinking it was called “aji no moto,” which is actually MSG. Oops. (Fortunately I figured that out when I got back to my hotel room and tasted it before attempting to use it in my nose.) Nor, in short, did I figure out any other strategy during my visit. I made many puddles on my hotel bathroom’s counter trying, though. When I got back home to Oakland, I had one whole day to unpack, do laundry, and repack for the next business trip—to China. My wife and mom were coming along on that trip, and Mom actually flew into SFO from Montana the same day I did from Tokyo. On our day-in-between, I told Mom all about my neti pot and how much I’d missed it. She was curious (you might recall from about a page ago that I inherited my useless nose from her), so I gave her a demo, and then she tried it herself. She was impressed right away, so later that day, she insisted we visit Victoria’s hippie-dippy pharmacy. She bought several extras to give to other members of our phlegm-plagued family. I also told Mom about how the Great Dust Cloud of China and its awful pollution meant we’d definitely want our neti pots along. We did not regret allocating luggage space to them, and anyone who saw the heinous black crud that came out of my nose twice a day would need no further persuasion to buy themselves a neti pot before visiting China. We coudn’t persuade Victoria to give it a try, though—early in our visit, she’d tripped on an unexpected curbstone and broken her shoulder while trying to stop her fall, and that pain had her full attention. I’m a klutz. It was only a matter of time before I would drop and break the ceramic one. I travel a lot, and fragile stuff in luggage breaks sooner or later. It’s a lot larger. I needed to measure and mix salt four times with the other kind to complete my routine, and I can get it all done with one batch in this one. Its shape is convenient. With a little effort, you can find a nonbreakable container that will hold several weeks’ worth of salt and fit inside the neti pot for compact packing. If you’re not convinced yet, read why this is such a good idea at WebMD or the New York Times. 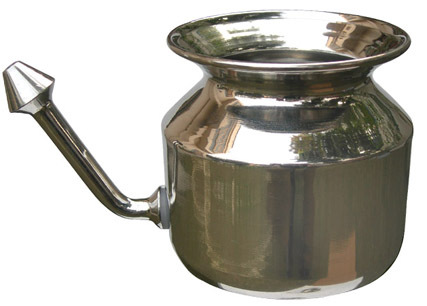 Buy, borrow, or steal a large stainless steel neti pot. Buy, borrow, or steal the biggest nonbreakable container you can that will fit inside it. I use the container some chocolates I bought in Korea came in. It’s perfect! Optionally add some baking soda to your salt and shake it up. Supposedly baking soda gives your nasal passages a bacteria-hostile pH. Mom adds just a spoonful to her salt container, but a little googling reveals that other people believe in a one-to-one mixture of baking soda and salt. I’ve just begun trying Mom’s method after years of using just kosher salt, and I haven’t formed any opinions yet. Find a cheap teaspoon or 5ml measuring spoon and do a Uri Geller number on it so it’ll fit inside your neti pot, too. I find that a heaping tablespoon per pot is about right for me, and too much salt is far better than too little, but decide for yourself. Keep all this stuff in or near your shower. Shower-temperature water is perfect, and if you do your neti routine in the shower, you don’t have to worry about dribbling on your clothes or needing to rinse yourself or the sink. Read and watch how to do it. Give it a try. You will not die. It’s not even uncomfortable. After you’ve been successful for a few days with the basic technique, learn how to do “jala neti stage 2” and give that a try. If you suffer from postnasal drip, this is awesome. I typically do a quarter pot stage 1 for each nostril then do a quarter pot stage 2 for each nostril. Stinging: the salt level isn’t right. Either too much or too little is bad, but if you ask me too little is worse than too much. Get in a habit of tasting your water before you use it each time, and you’ll quickly develop a sense of the optimal salt level for you. It should taste pretty salty—about like your tears. Aching: the temperature isn’t right. It’s probably too cool. A lot of people recommend body temperature or room temperature, but I like it warmer than that. To me, my regular shower water temperature is perfect. Burning: the temperature is too hot. You can buy special salts and pre-mixed packets of salt and all kinds of other crap, but don’t bother. You’re just making things fussier and more expensive for yourself. You can also buy various neti pot “solutions,” where you’re typically supposed to add an eyedropper full to your salt water. Don’t bother. I tried one that was recommended for sinus infections—some kind of homeopathic or herbal junk, but I can’t remember the details—and it actually made things worse for me. I’d love to hear about your experiences. Leave me a comment!